“Show me the data!” shouted statistician Talithia Williams during her recent TED talk about the empowerment and motivation individuals can obtain when they take ownership of their bodies and related data. This isn’t a new concept, but it is most definitely a quickly evolving one. Health wearables have given us a rare opportunity to try to understand what still seem like such mysteries: our bodies, our behaviours and how they influence one another. It’s no surprise that the concept is booming in popularity, either. In IDC Canada’s “Canadian Consumer Wearables 2014-2018 Forecast,” it was estimated that nearly 111 million wearable devices will be shipped globally within the next four years. IDC Canada also reported that 18% of Canadian respondents were interested in wearables that could track both their health and performance. Complex accessories that sync with third-party apps such as Fitbit Flex, Up by Jawbone or Nike Fuelband are just scratching the surface when it comes to digital health. Technology is going beyond simply counting our steps, timing our sleep and recording our pulse. Wearables are shifting from merely monitoring lives to improving and potentially saving them. The military has been recognized as a niche market for the wearable industry for a while now. The military has a profound responsibility to protect and equip its soldiers to the best of its ability and it is no surprise that it’s looking to wearable technology for solutions. High-tech textiles embedded with sensors might be the answer the military has been looking for. These wearables could permanently become a part of the battle defence uniform of the solider of the future. A complete physiological sensing system has been developed that uses gel-free sensors to form an electronic network that can monitor heart rate, body posture, respiration and skin temperature. This network offers military personnel insights into the environmental and biological conditions of individual soldiers. But how is this life saving? This system could potentially add acoustic sensors, which could assess ballistic impact such as bullet or knife wounds. The system could pinpoint the exact location and severity of the wound, helping first responders to treat the trauma faster, thereby increasing the individual’s chances of survival. This technology isn’t exclusively for the military—it could prove to also be beneficial for police officers, firefighters, astronauts, athletes or everyday consumers. For example, a surgeon could receive an alert that a bullet has penetrated a patient’s abdomen. A variety of other biosensors, such as pressure, orientation and humidity sensors, could be embedded into wearables that help to detect and access the wound before the individual even arrives at the emergency room. By accessing the data before a patient’s arrival, the surgeon could book an emergency room immediately, streamlining the traditional triage process. Everyday people can also use these types of devices. MaRS Health venture services client Code4Armour produces an alert band with advanced medical profile management. By using Near Field Communication technology, the band allows first responders to scan the band to obtain key medical information about the wearer. The band can store vital information such as emergency contact information, life-threatening conditions (such as allergies, epilepsy or Alzheimer’s disease), medical treatment information (such as insurance number, DNR orders or an organ donor card), medications and medical history. This wearable gives whoever is administering the treatment a quick snapshot into the patient’s health history, empowering them to make quick and accurate decisions. Impakt Protective is another MaRS health venture operating in this space. The company’s product, The ShockBox, is a sport helmet that is embedded with a sensor that detects and evaluates head injury or impact. The sensor works wirelessly and enables parents, coaches and trainers to keep a history of head impact data for each player, helping them to make better decisions on the sidelines. The sensor is attached to the helmet and works by accessing the linear and rotational acceleration magnitude and direction of any hit. The ShockBox can identify an individual player on the field and alert the coach that he or she may have sustained concussion or severe impact to the head, which would require medical attention. This sensor can be attached to a variety of helmets, including hockey, bicycle, horseback-riding and football helmets. Wearable sensors like this one could make a significant impact in sports leagues where one out of five head injuries results in a concussion. The technology doesn’t stop there. Today, mainstream wearables focus on the monitoring of body functions, but what if something you wore could proactively treat the injury itself? 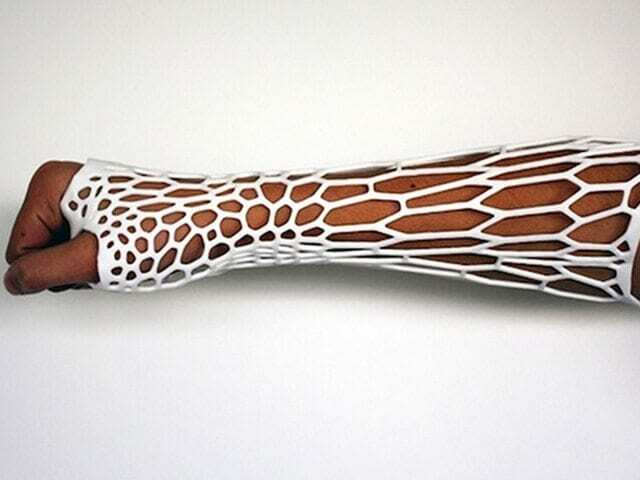 We got a glimpse of this future when industrial designer Deniz Karasahin made an announcement about the Osteoid, a 3-D printed cast. The Osteoid is customized to the exact dimension of an individual’s arm and is designed in a lattice pattern to reduce the itchiness typically associated with casts. However, the Osteoid also goes one step further: the cast can work in tandem with a low-intensity pulsed ultrasound system that stimulates and accelerates the healing process. In a country like Canada, where approximately 17% of all injuries are fractured or broken bones, a wearable like this one could revolutionize the treatment process. Another example is Lynxio, a company that pitched at the 2014 Up-Start! Competition. A unique feature about the company’s product, the Lynxio digital knee brace, is that it also monitors recovery. The brace helps individuals heal by managing their recovery, visualizing process, and linking to and updating with their physiotherapist. Physiotherapy and exercise are the two most commonly prescribed daily treatments for knee injuries and they have been proven to work. However, only 10% of patients actually do the exercises and, of that number, only 5% do them all correctly. This product works to empower users by motivating them with feedback and analytics, truly allowing them to take ownership of their body’s data. Battery life and charging methods are important to consider for these devices, which are only useful for as long as their batteries allow them to be. Viable options include adding photovoltaic cells to a uniform to harness the sun’s energy, or using thermoelectric devices that would be able to convert temperature differentials into electricity. The solution could also lie within us: our body heat might become the ultimate charger for our wearable devices. The Korean Advanced Institute of Science and Technology has devised a method thats uses a printed ultra-thin thermoelectric power generator that draws energy from the skin’s surface. Read the MaRS Market Insights report “Wearable Tech: Leveraging Canadian Innovation to Improve Health” to learn more on this subject.